Linda Davis, special advisor to the president for philanthropy, will retire on Jan. 31, 2019, after 41 years of “working” at Stetson. 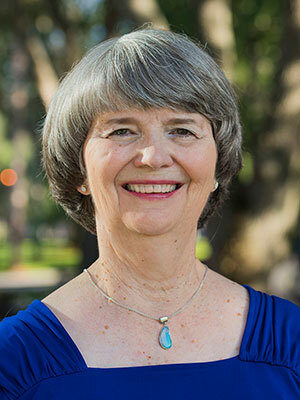 Linda Parson Davis ’73 is retiring on Jan. 31, 2019, following 41 years of service to Stetson. Yet, Davis didn’t actually work a day during that time, she asserts without hesitation. “It always felt like a calling to me,” Davis says, simply. Such is life — and a career — when one spends more than four decades at her alma mater — the same university from which her parents, husband, son and daughter-in-law, and sister-in-law all graduated. Coming out of high school, Davis ’73 didn’t even apply to another school. Stetson was a virtual rite of passage. Through the years on campus, Davis held numerous positions of leadership in alumni relations and development, with titles that included Director of Alumni Programs, Director of Development, Associate Vice President for Planned Giving, Vice President for University Relations and her current role, Special Advisor to the President for Philanthropy. Davis established the first full-time planned-giving program and currently is helping to guide the successful completion of her fourth major fundraising campaign. Her time at Stetson has spanned four university presidencies and resulted in widespread goodwill on campus and across Hatter Nation. Davis just doesn’t see it that way. Typical Linda Davis —a philanthropic leader who, herself, always has given. Three generations of Hatters. Front row: Rabel and Harold Parson. Back row: Michael, Joseph and Linda Davis. Rabel, now 94, met her future husband while a senior at DeLand High School. Harold Parson, now deceased, was a freshman at Stetson. They were in the choir together at church. Since a very young age, Rabel had taken music lessons at Stetson. Davis didn’t know it at the time, but her future husband, Michael Davis, had started at Stetson three years after she arrived on campus. 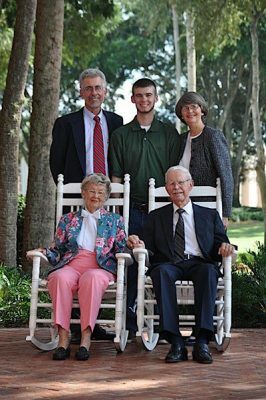 And while a Stetson love story didn’t result — “we never met as students,” as Davis recounts — their son, Joseph Davis, did meet his future wife, Allison, at Stetson. Indeed, Davis’ impact on Stetson has been as vast in scope as it has been long in time. After graduation and a little graduate work, she worked locally and then went overseas for missionary work before returning to DeLand and getting a job on campus as coordinator of alumni programs in 1978. Davis remembers being the first hire of a new vice president at the time, H. Douglas Lee, who later became the university’s president. Davis also recalls being interviewed by then-President Pope Duncan. At the time, Davis thought, “Why so much attention on a lower-level position?” Turns out, there were visions of building something special in the alumni office — and Davis was the one to begin making those things happen. Devoted to her work, Davis also obtained a master’s degree from Vanderbilt University in 1985, focused on institutional advancement through alumni development. Every third weekend, Davis flew to Nashville to attend classes and was back in her office on Monday morning. She also attended a four-week summer term at Vanderbilt, saving up her Stetson vacation time. “I never dreamed I would come back and work at Stetson for so long. … Again, it felt like a calling. This is what I felt that I was to do,” she says. Then Davis shifted the conversation, deflecting to a preferred topic: other people. “Philanthropy is very personal; it’s very intimate. And there are so many worthy causes that people can give to. When you work with people who are deciding where they want to give their resources, it’s a sacred moment to me,” Davis explains. Not coincidentally, her favorite campus event is a springtime gathering of donors and their student beneficiaries, recipients of scholarships. Amid hugs and the warmth of appreciation and pride, there are tears, heartfelt emotions on display. “It is powerful,” she says of the event. As for the future, Davis has plans: spend more time with her husband, continue caring for her mother, visit her son and daughter-in-law, and remain active at church and in community organizations. Until then, she will help transition the details of the current Beyond Success – Significance comprehensive fundraising campaign, which is nearing its end. Linda Davis has, and then some. In turn, Davis is characteristically thankful.